Helps correct deep and severe wrinkles or augments lips for a more full appearance. Contains the antioxidant mannitol for longer-lasting results. Hyaluronic acid helps restore volume to skin while stimulating collagen growth. Low extrusion force for comfortable treatments. Hyaluronic acid 24 mg/ml, sodium phosphate buffer pH 7.1 q.s. for 1 g, and mannitol. Hyaluronic acid: helps skin retain moisture, restoring lost volume, and helps stimulate collagen growth for improved skin texture. Mannitol: an antioxidant that helps reduce degradation of the hyaluronic acid. Inform patient of product indications, contraindications, incompatibilities, and potential undesirable effects. Discuss possible risks and ensure they are aware of signs and symptoms of potential complications. Ensure filler is at room temperature. Check package. Do not use if package is damaged or it is past the expiry date. Screw needle onto luer lock connection, gently turning until it is firmly in place. The supplied needles are recommended. If using a cannula, depending on injection technique and area treated, ensure the inner diameter is at least as big as the supplied needles. Pull needle protective cap horizontally to remove. Slowly inject into the mid to deep dermis at about a 30 to 35 degree angle between the needle and the surface of the skin. Use the linear threading, fanning, cross-hatching, serial puncture, or sandwich injection techniques. Quantity depends on area corrected. If needle becomes blocked, do not force the syringe plunger. Stop injecting and replace the needle. After injection, massage the treated area to ensure the product is evenly distributed. Stop injecting immediately if patient experiences vision changes, signs of a stroke, skin blanching, or unusual pain during or soon after the injection. Ensure patient receives prompt medical attention, and possibly evaluation by an appropriate specialist if there is intravascular injection. Properly dispose of used needles and other opened needles and syringes after use. Not for use in patients using NSAIDs, antiplatelet agents, anticoagulants, immunomodulator, or similar drugs. Not for use in patients with allergic diseases, autoimmune disease, sarcoid-like granulomatous disease, or subacute bacterial endocarditis. Not for use in patients with inflammation or skin infection, including acne. Not for use in patients with a known sensitivity to products made with hyaluronic acid. Not for use in patients prone to developing skin inflammation or those with a tendency to develop hypertrophic scars or keloids. Not for use in nursing mothers. Not for use in children or adolescents. Not for use in the nose or glabellar area. Injection into glabellar wrinkles carries a risk of necrosis (tissue death). Not for injection into tendon, muscle, or bone. Not for increasing breast volume. Not for intravascular injection (into blood vessels). This could lead to embolization, vessel occlusion, ischemia, or infarction. Inject slowly and apply least amount of pressure necessary. Not for injection into an area already treated with a non-resorbable filler or with a recent resorbable filler treatment. Not for concomitant injection in the same area as botulinum toxins. For twelve hours after injection, patient should not apply makeup. For two weeks after injection, patient should avoid prolonged exposure to sun, UV rays, cold temperatures, and heat, including sauna and steam room. Not for immediate association with laser treatment, chemical peeling, or dermabrasion. 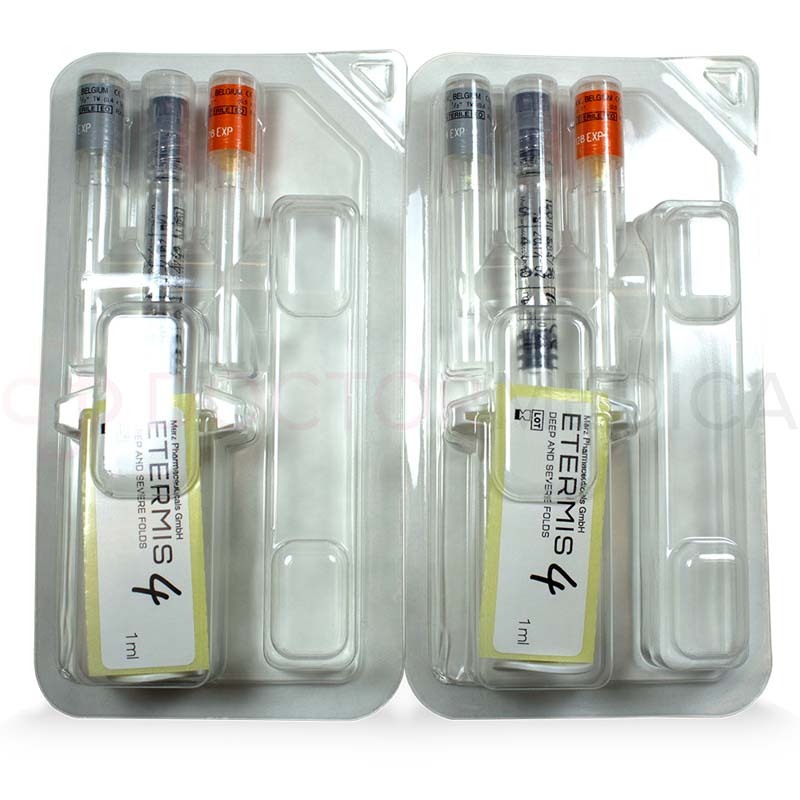 Only for use by healthcare professionals with appropriate training, experience, and anatomy knowledge at and around injection site. Do not inject more than 20 ml of reticulated hyaluronic acid per person per year. Do not re-use. Sterility cannot be guaranteed. Inflammation, including redness, erythema, edema, swelling, pain, and hyperthermia. Irritation, tenderness, or paraesthesia (tingling). Bleeding, bruising, hematoma, or telangiectasia (spider veins). Vascular occlusion (blood vessel blockage). Formation of non-inflammatory or inflammatory nodules, induration (hardening), or asymmetry. Skin discoloration. Generally this is a bluish discoloration, known as the Tyndall Effect, caused by superficial injection. This could also be redness caused by ischemia (inadequate blood supply) or whiteness or blanching caused by an occluded (blocked) artery. Hyperpigmenation, especially in Fitzpatrick phototyping scale IV to VI skin types. 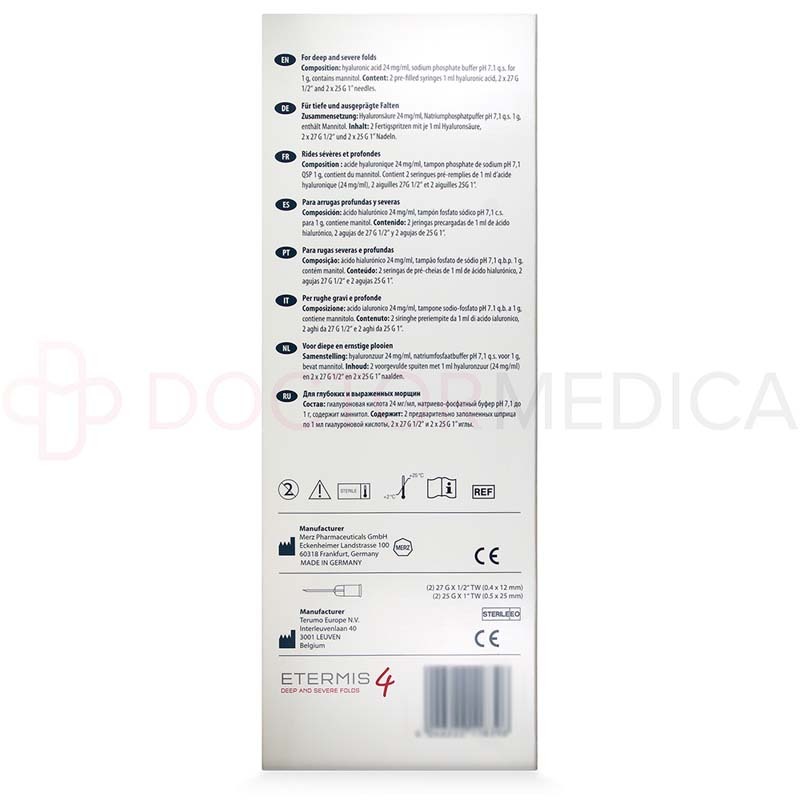 Immediate or delayed hypersensitivity or allergic reactions, including urticaria, anaphylaxis, or Quincke's edema. Conjunctival infection, corneal edema, hyphema, ptosis, ophthalmoplegia, haemolacria, or other ocular and periorbital complications. Delayed injection-related inflammation, including persistent erythema (redness), formation of acne papules, or ecchymosis (bruising). Delayed infection, abscess, biofilm formation, or recurrent herpetic lesions. Delayed product migration, displacement, or dislocation. Delayed non-inflammatory or inflammatory granuloma formation (foreign body reactions). Delayed dermal fibrosis, ulcer, scarring, or cellulitis (bacterial infection). Lack of efficacy or reduced effect. Rarely, ocular or periorbital complications, including temporary or permanent vision impairment, blindness, diplopia, or xanthelasma. Rarely, headache, dizziness, nausea, or vomiting due to retinal or cerebral artery occlusion (blockage) or stroke. Rarely, non-thrombotic pulmonary embolism, alveolar hemorrhage, or ground glass opacities including dyspnoe or cough. Rarely, in patients with hepatitis C and interferon treatment, formation of sarcoid granulomas. Rarely, cerebral ischemia (inadequate blood supply) and cerebral hemorrhage or stroke. Rarely, hypopigmentation, especially in those with Fitzpatrick phototyping scale IV to VI skin types. Adverse events may be immediate or delayed. If reactions persist longer than one week, patient should report them to their physician as soon as possible. These may not be all the possible side effects. 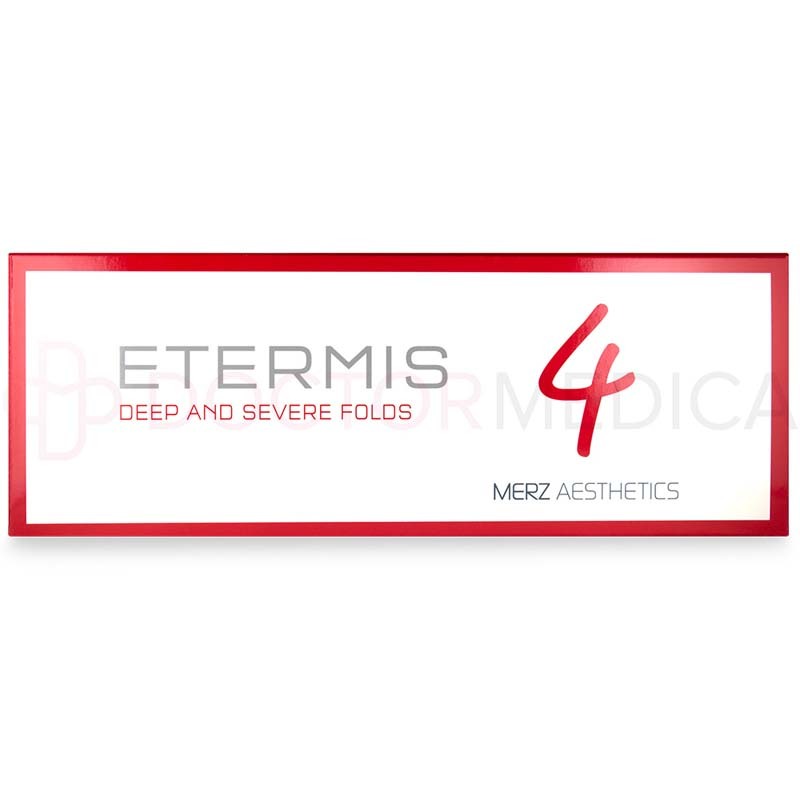 This dermal filler helps correct deep and severe wrinkles or enhances lips. The hyaluronic acid gel is monophasic and cohesive to give it a smooth consistency for natural-looking results, and the mannitol acts as an antioxidant to help reduce degradation for longer-lasting results. This dermal filler has good tolerability, a low rate of adverse events, and low extrusion force for a comfortable treatment. The results of this dermal filler usually lasts about twelve months. This may depend on patient age, gender, skin quality, lifestyle, injection area, and other factors. To maintain their results, your patients should repeat their treatments annually. Why do doctors use this dermal filler? Dermatologists, plastic surgeons, and other doctors use this dermal filler to correct the look of deep and severe wrinkles, including nasolabial folds and marionette lines. 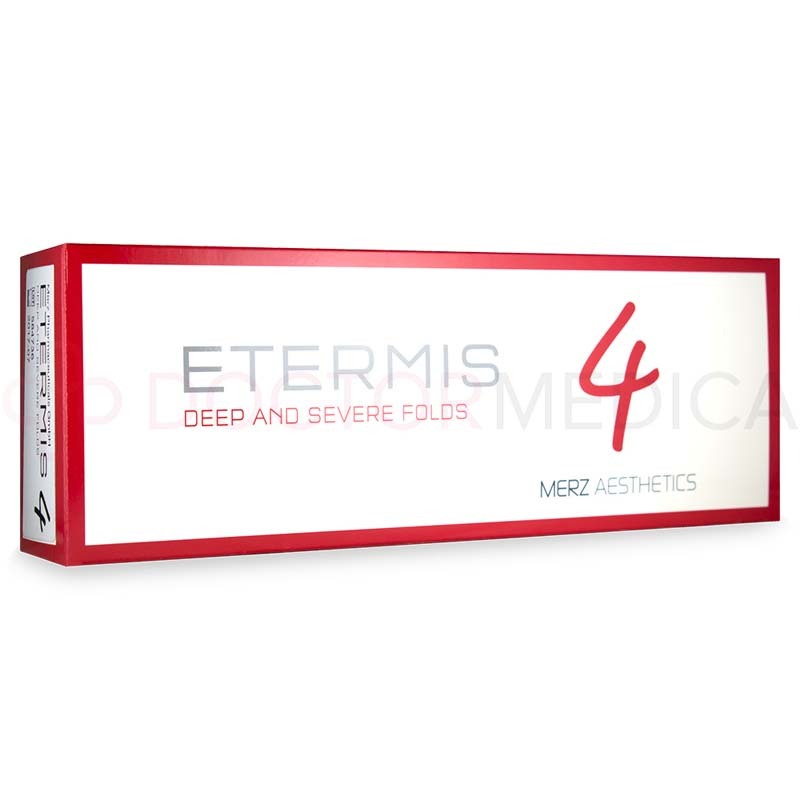 Doctors may also use this filler for lip enhancement, adding volume and reshaping thin lips. How does ETERMIS 4 work? This dermal filler is made of hyaluronic acid particles that are monophasic and cohesive, allowing them to effectively fill wrinkles with a smooth, natural-looking texture. The hyaluronic acid particles hold moisture within the dermis, and this moisture restores lost volume. The added volume supports the skin to reduce the look of wrinkles and give the skin a more youthful texture. Hyaluronic acid can also stimulate collagen growth, improving skin texture. This particular dermal filler contains mannitol, an antioxidant, and these antioxidant properties help trap free radicals that would otherwise damage the hyaluronic acid. This helps give the filler longer-lasting results. When and how do I use ETERMIS 4? How do I use this dermal filler? To help maintain the results of the treatment, you should administer this dermal filler about once a year. Using a needle, inject the filler gel into the mid to deep dermis, at the location affected by the deep wrinkle. Gently massage the treated area after injection to ensure the gel is evenly distributed within the skin. Inject this filler about once a year. Using a needle, inject the filler into the mid to deep dermis. To ensure uniform distribution, gently massage the treated area. 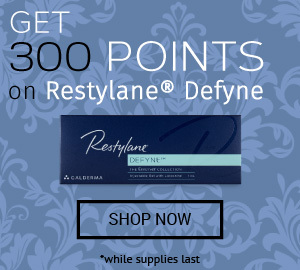 Can this dermal filler be combined with other treatments? You should not inject this filler into a location containing a permanent filler. Do not inject this filler at the same time and location as botulinum toxins or in conjunction with laser, chemical peel, or dermabrasion treatments. How do I store ETERMIS 4? Store between 2° C and 25° C (35.6° F and 77° F). Do not freeze and do not expose to heat or frost. Keep away from light and avoid impacts. Where can I buy ETERMIS 4? 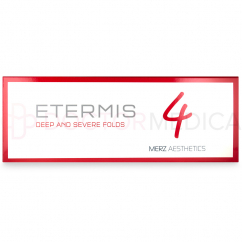 You can buy ETERMIS 4 online at Doctor Medica by choosing a quantity and adding to cart. You can also phone a helpful customer service associate to order this dermal filler or other cosmetic and medical supplies.